The memory card is where you will store all of the images you photograph until you off-load them to your computer or hard drive. It’s a very important accessory to own, since you can’t create any images until you have one in your camera. If you own a digital point-and-shoot camera, you are most likely already familiar with Secure Digital (SD) cards. The 7D uses CompactFlash (CF) cards, a larger and sturdier version of the SD card (Figure 2.1). The size of your card is very important, especially since the 7D can shoot up to 18 megapixels in both RAW and JPEG fi le formats. 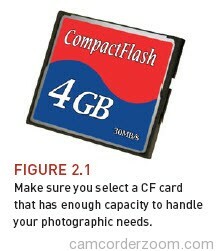 You can fi nd CF cards in many sizes, but you will probably not want anything smaller than 4 GB per card. It’s also a good idea to have more than one card tucked away in your camera bag to use as backup. Consider buying Ultra Direct Memory Access (UDMA) cards. These cards are generally much faster, both when writing images to the card as well as when transferring the fi les to your computer. If you are planning to use the continuous shooting mode (see Chapter 6) for capturing fast action, you can gain huge boosts in performance just by using a UDMA card. Don’t skimp on quality because of a good price. Remember, the card is the only place that your image fi les are stored until you can transfer them to a computer. A high-quality card might cost a few more dollars but will be more reliable and will last much longer than a less expensive one. You don’t always know that something is wrong with a card until it’s too late, and having a reliable card is one step to help prevent that. Along with a CF card, it’s also a good idea to have a CompactFlash card reader. It is possible to connect your camera to the computer to retrieve the fi les, but over time you will unnecessarily drain your camera’s battery. Some card readers can also be connected to the computer via FireWire, making transfer time much faster than using the USB cord from your camera.